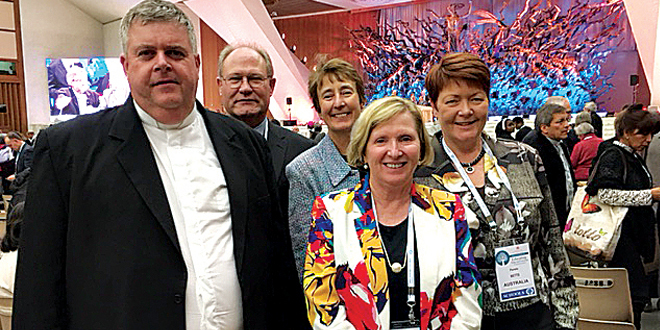 Congress delegates: At the world congress on Catholic education in Rome are (from left) Cairns diocese’s Vicar of Education Fr Neil Muir, Cairns Catholic Education executive director Bill Dixon, Queensland Catholic Education Commission executive director Dr Lee-Anne Perry, Townsville Catholic Education executive director Dr Cathy Day and Brisbane Catholic Education executive director Pam Betts. QUEENSLAND Catholic education leaders have returned from Rome with a personal call from Pope Francis etched in their minds and hearts. 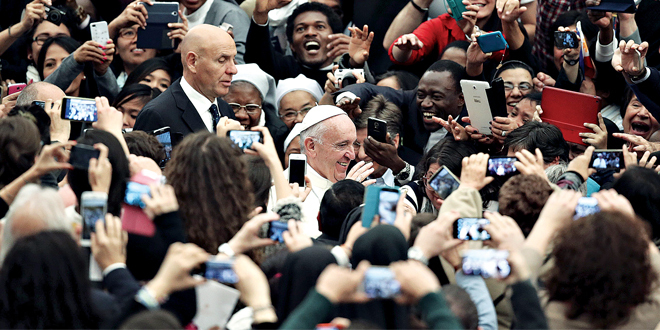 The Pope inspired the educators at a world congress on Catholic education, Educating Today and Tomorrow – A renewing passion, held in Rome from November 18-21. Queensland Catholic Education Commission executive director Dr Lee-Anne Perry was among about 1000 delegates at the congress, along with representatives from every state and the ACT, from the National Catholic Education Commission and state-based commissions, and many of the diocesan education offices. There were also representatives of Catholic universities, including Australian Catholic University and Notre Dame university. Pope Francis addressed 15,000 people on the final day of the congress, and it is a moment Dr Perry will never forget. She said the Pope’s presence was the highlight. Apart from the Pope’s physical presence, Dr Perry said “it was interesting how often he was referred to by the speakers all the way through”. “His really significant impact on thinking today and thinking around education was quite tangible,” she said, recalling the congress, which was organised by the Holy See’s Congregation for Catholic Education. Brisbane Catholic Education executive director Pam Betts said Pope Francis “was a source of wisdom and inspiration in his reflections”. “Pope Francis called on those gathered to open up new horizons and to reach out to those who are poor and at the margins,” Ms Betts said. 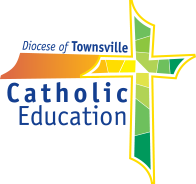 Townsville Catholic Education executive director Dr Cathy Day said the Pope’s attendance on the last day of the congress was the most inspiring part of the four days. “Pope Francis gave such encouragement in our work, reminding us that Catholic education is at the heart of the Church’s mission in the world,” Dr Day said. “He also challenged us to get out of our comfortable existence and go to the places, to the outskirts where children are denied the right to education, live in material poverty and experience a wounded humanity. “He wants Catholic educators to ensure our schools are oases of peace, beacons of hope and places of high-quality teaching and learning. “For the Year of Mercy he asks us to rethink the fourteen works of Mercy to consider ways we can enact them in our schools. Dr Perry said the congress was “very affirming in terms of (recognising) the critical place that Catholic education plays … contributing to the evangelisation work of the Church, … but also contributing to the common good in terms of the wider society”. She said in a place like Australia that meant challenging the prevailing secular culture dominated by materialism and market-driven forces. In the developing world it meant providing education where there was none. Dr Perry said a key message was the importance of dialogue – “engaging in dialogue within our institutions and outside our institutions and that probably led on to what the Pope said”. She said the Pope particularly emphasised his Year of Mercy theme of “opening doors” – “the importance for us as Catholic educators to open the doors, and he said that in lots of different ways”. “He spoke about educating with open horizons – that we need to not build walls around what we’re doing but to, in a sense, break down the walls,” she said. “In fact he said one of the challenges for us is that Catholic education – and we’re talking worldwide – has tended at times to be selective, to build up walls, and he was saying, No, we need to open doors, open walls, open our horizons. Dr Perry said the other side of that view was that Catholic education in Australia, “is really well placed”. “We’re a long way along that journey. Bear in mind (the Pope is) talking to a worldwide community,” she said. A key message from the congress, for Dr Perry, was “that we have to stay open at this time in terms of global conflict and the pressures in terms of resistance to, say, refugees”. Another discussion centred on “integral education”, concerned with a focus not just on the head but on the heart and on service to others. “Again (this discussion) was a bit of a sign of where we are at because they were talking about service learning,” Dr Perry said. Dr Perry said this reinforced the importance of Catholic education’s mission and identity particularly in the face of secularisation in society. She said the congress was “an affirmation of what has been done, an affirmation of the importance of Catholic education and it sets a call to continue and to renew and reinvigorate that passion”.